Twenty Thousand Leagues Under the Sea is a classic science fiction novel by French writer Jules Verne published in 1870. It tells the story of Captain Nemo and his submarine Nautilus, as seen from the perspective of Professor Pierre Aronnax after he, his servant Conseil, and Canadian whaler Ned Land wash up on their ship. 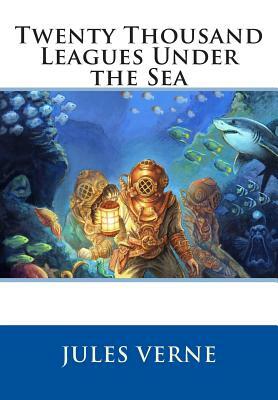 On the Nautilus, the three embark on an undersea journey which takes them around the world. The book was highly acclaimed when released and still is now; it is regarded as one of the premiere adventure novels and one of Verne's greatest works, along with Around the World in Eighty Days and Journey to the Center of the Earth. The description of Nemo's ship, the Nautilus, was considered ahead of its time, as it accurately describes features on submarines, which at the time were very primitive vessels. Thus, the book has been able to age well because of its scientific theories, unlike some other of Verne's works, like Journey to the Center of the Earth, which are not scientifically accurate and serve more simply as adventure novels.